Stuart and Barbara Hughes both had secure and well-paid jobs in the food industry, but gave them up for more family time. After juggling busy careers with having a young family, the couple from Dromore, Co Down, decided they wanted to start up their own business and devote more time to their children. 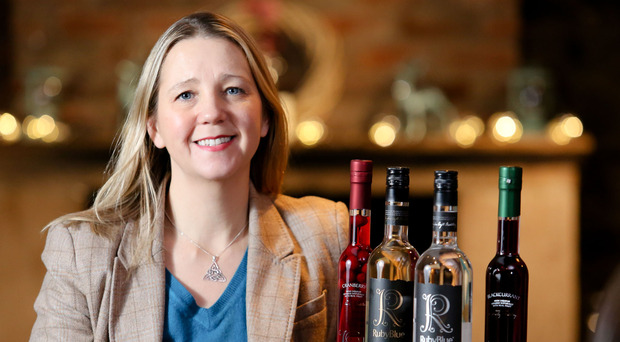 Now, almost eight years on, they own a pub and distillery in Moira, Co Down, and their company, RubyBlue, produces more than 100,000 bottles of vodka and liqueurs annually for export. Barbara (41) said: "It was 2010 and we were in the middle of a recession when we quit our jobs and everyone thought we were nuts. "We probably were a wee bit nuts, to be honest. I worked for Rich Sauces in Newtownards at the time. I had been with them for quite a while and would have been responsible for product and sales development. "My main role would have been going into companies and helping them with product development, encouraging them to use our products and showing them how to use them properly. "Stuart worked for Nestle and he was national sales manager and it was a really big, bold move to leave our jobs when we were on decent pay, at a time when a lot of people were losing their jobs. "We had three children who were two, seven and 15 at the time, and we decided we wanted to work for ourselves. Both of us were doing lots of travel, we would speak to each other by phone, getting home in the evening, getting dinner, getting the kids in bed and doing the same thing again." At the time, Barbara and Stuart, also 41, had noticed that consumers were more becoming increasingly interested in the ingredients and manufacturing processes of the foods they ate. The couple believed there was a gap in the alcohol market and began to look at potential recipes and products. "At that stage it was very difficult to find an alcohol product that was produced in a natural way," said Barbara. "Flavoured vodkas were very popular, but they were very harsh and unpleasant. We thought there was an opportunity for people who wanted to live a healthy life but still wanted an alcoholic beverage, that we could produce a better tasting product using better ingredients and made in a more natural way." Barbara discovered a recipe for a fruit liqueur that had been developed by a woman in Carlow in the Republic. "We bought the concept off her," she said. They started out by distilling fruit liqueur in their kitchen, while at the same time working to achieve the necessary health and safety standards and getting to grips with licensing laws. Barbara said strict legislation and a lack of interest from retailers here meant that they were forced to look outside Northern Ireland when it first came to selling their product. "We started to export right away and that wasn't in our business plan when we first started out. We were going to retailers here and they didn't see a need for our product, they believed that consumers just wanted to drink alcohol to get drunk and they didn't choose drinks for the flavour and manufacturing techniques and ingredients," she said. "We quickly realised that we had to go to other, more developed markets." RubyBlue's first customers were in Australia - which came about as a result of its social media presence. The company has used Facebook, with its following growing from 20,000 to 150,000. Over the years, it has had to overcome numerous challenges over exporting alcohol. The second country it shipped its product to was Turkey and Barbara said she quickly had to get to grips with the red tape involved with exporting alcohol to a Muslim country. "During the first delivery, it turned out that the delivery company wasn't legally allowed to take alcohol into Turkey, so it got stopped in Milan and we had to sort all that out," she said. The firm now exports its products to Abu Dhabi, Finland, Luxembourg, Russia, Lebanon and other countries. Its flavoured vodkas and liqueurs are also stocked at home in Tesco, Sainsbury's, SuperValu, Asda and Marks & Spencer. "People are now crying out for products like ours," said Barbara. "When we started out, people didn't even really know what artisan was." They have moved through premises as the business has grown from producing 3,000 bottles of alcohol in the first year to an impressive 145,000 bottles this year. Most recently, they bought a pub in Moira - the Four Trees - and have ambitious plans to renovate a barn at the rear into a distillery where they will also be able to carry out tours. "We are going to have a visitor centre and we will be Ireland's first distillery pub, which will be called The Still House," said Barbara. "It has been a huge investment, but the potential it has given us is incredible. "We see it as future proofing the business. The pub is open, although we haven't got the signs with the new name up yet and we are just concentrating on the Christmas bookings." So, with the massive success of the business, have Stuart and Barbara achieved their aim of a better work life balance? "From my perspective I was home a bit more, but it has been very, very busy," said Barbara. "We had got to the stage where we were able to spend more time together at the weekend but now, with the pub, we are back to 18, 19-hour days. "It's different when it's for your own business, though."